Profesional yet easy to use video to Home DVD maker and video to Home DVD creator for those dreaming to create their own Home DVD movies! 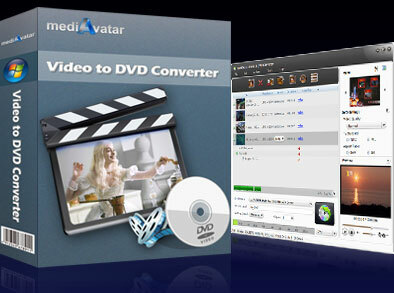 mediAvatar Video to Home DVD Converter helps Home DVD movie dreamer to create Home DVD movies from almost all high-definition and standard-definition video formats [MP4, MKV, AVI, DivX, XviD, HD camcorder videos (M2TS, MTS, TS), iPhone 4 videos (MOV), MPG, MPEG, QuickTime Videos (MOV, QT), DV, VOB, Real Video (RM, RMVB), WMV, H.264/AVC, ASF, DAT, FLV, 3GP, etc. ], and also convert and burn video files to Home DVD folder or ISO file. Create a personalized Home DVD menu, clip videos, crop video frame, add subtitle and audio files, embed watermarks, apply artistic effects, and the like to create your own Home DVD movie now. Download mediAvatar Video to DVD Converter for a free trial and start to create your own DVD movies now. Create DVD movies with your videos collected or downloaded from video sharing sites or recorded by your camcorders or 4smart phone, including HD camcorder videos (M2TS, MTS, TS), iPhone 4/iPhone 4S videos (MOV), MP4, MKV, AVI, DivX, XviD, MPG, MPEG, QuickTime Videos (MOV, QT), DV, VOB, Real Video (RM, RMVB), WMV, H.264/AVC, ASF, DAT, FLV, 3GP, etc. Also available to convert and burn videos to DVD folder or ISO file. Create DVD menu in a wink just by choosing a menu template, and if you want, add background music or picture, menu title and opening film to personalize DVD menu, and even create menu thumbnails to make your DVD menu more live. Clip any video to extract your favorite segments with unwanted ones removed. Create DVD movie of your own with custom subtitles (up to 32 subtitles files) and soundtracks (up to 8 audio files) inserted to the DVD movie. You can change the movie frame effects by cropping video frame size, adding artistic effects and inserting picture & text watermarks. Before converting and burning videos to DVD movie, this DVD creator allows adjusting the video/audio quality, bit rate, television standard, aspect ratio, resize mode, audio channel, sample rate, and many other parameters as you like. You can create DVD movie without menu, or with menu but not displaying menu while playback. This video to DVD converter can add chapters to a DVD title automatically during video to DVD burning once you set the chapter interval beforehand. Convert videos to DVD movie on DVD-R, DVD+R, DVD-RW, DVD+RW, DVD+R DL, DVD-R DL, DVD-5, DVD-9. This video to DVD creator allows you to preview videos with or without clipped or effects applied, effects and settings applied in real-time; and even compare original and edited videos to check the effects. Take a snapshot of any movie image you fancy during preview. Set a "Post-Task Action" (shut down, stand by, hibernate system, exit application, do nothing), then the DVD maker will automatically perform the action for you once the DVD burning is complete. Makes the video to DVD burning run in the background for reducing CPU usage, not affecting other running applications.